Wash strawberries, then lay them out on a few paper towels to dry for a few minutes. Chocolate doesn’t stick very well to wet strawberries. Fill a small pot with about an inch and a half of water, then insert your heatsafe glass, making sure not to get any water inside the glass. This will serve as your DIY double-boiler. Place this on a burner and turn it to medium-low heat. Add your cholaca to the glass and stir it occasionally as it melts. To make caramel and cholaca dipped strawberries, you’ll want to dip them in your caramel sauce first (it may need to be microwaved), then sprinkle them with your course sea salt (optional but oh-so-good), then freeze them for 20-30 minutes before dipping them in chocolate. If you go from caramel sauce right to cholaca, it gets a little messy. 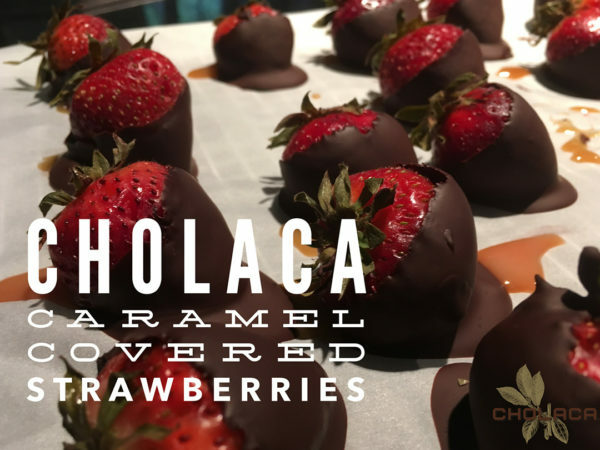 Once the cholaca is completely melted (check that there are no lumps), go ahead and dip in a strawberry! I just used my hand here, but after a while, I found that the strawberries would get too heavy once they were dipped, so I started sticking them on a fork before I dipped them. Place your dipped strawberries on a baking sheet or large dish covered with wax paper to let harden. Optional: drizzle with caramel sauce. Enjoy immediately or stick them in the fridge or freezer for a few days.